The scale bar in fig. 6 also applies to figures 1, 2, 3 and 7; the 100 µm scale bar applies to figures 4 and 5. Figs. 1-7. 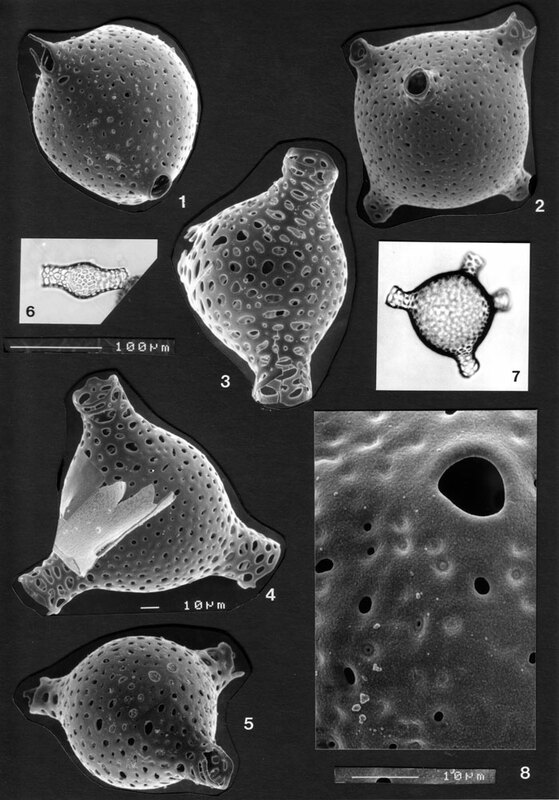 Trisolenia megalactis . Figs. 1, 2: forma megalactis. Figs. 3-7: forma pandora. BSS 28B(VIII/1133, 986, 1019, 1022 and 938); BSS 38B(F) EF G28; IOW 144(F). Fig. 8. Detail of shell wall of M. magnisphaera. Note granular structure, closure of some smaller pores and and polygonal shape of the large pores. BSS 28B(VIII/1048).